The number of visitors to the ancient city of Troy has nearly doubled after Turkey declared 2018 as the Year of Troy, according to the region's director of culture and tourism. The ancient city, located in northwestern Turkey's Çanakkale province, was added to UNESCO's World Heritage List 20 years ago in 1998. Turkey is specially marking 2018, as the 20th year anniversary of Troy's recognition by UNESCO. 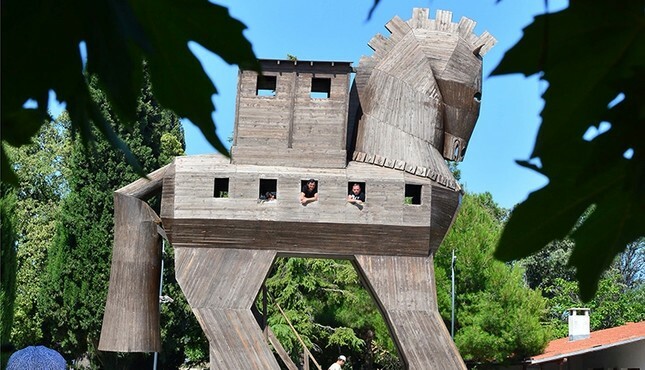 In an interview with Anadolu Agency (AA) Çanakkale's Director of Culture and Tourism Kemal Dokuz said that the Year of Troy has boosted the city's visitor numbers even though Çanakkale and Troy were already top destinations for international visitors. According to Dokuz, more than 233,000 people visited Troy between January and July 2018, while the number for the same period last year was 136,000 people. April was the busiest month for the ancient city with some 51,000 visitors. Dokuz also announced the Troy Museum will be opened to visitors in August or September, another feature expected to draw even more visitors to the city. The 10,000-square-meter museum which cost TL 50 million ($11.1 million) will showcase archeological findings of the ancient city, as well as 24 gold pieces known as the treasures of Helen of Troy, which were returned to Turkey from the United States after 125 years. Among foreign guests to the city this year, celebrities have also come to participate in Year of Troy. Last week, American actress and model Megan Fox toured the ruins while shooting one of the episodes of the documentary film, Myths and Mysteries with Megan Fox. The 4,000-year-old ancient city of Troy is one of the most famous archeological sites in the world. First excavations at the famous city were undertaken by the famous archeologist Heinrich Schliemann in 1870. The historic setting of the Greek Trojan War in which Spartan and Achaean warriors from Greece besieged the city in 13th century B.C. was immortalized by the Greek poet Homer in his epic poem Illiad.